The purpose of this page is to inform our users on how to use the USA Gymnastics Reservation System integration. It is broken into two sections - Registering Gyms and Meet Directors - please click the tab for your specific role. Please contact us at support@meetmaker.com if you need additional assistance. Instructions on how to complete a MeetMaker meet registration using the USA Gymnastics Reservation System. There is both a video and step-by-step instructions below. 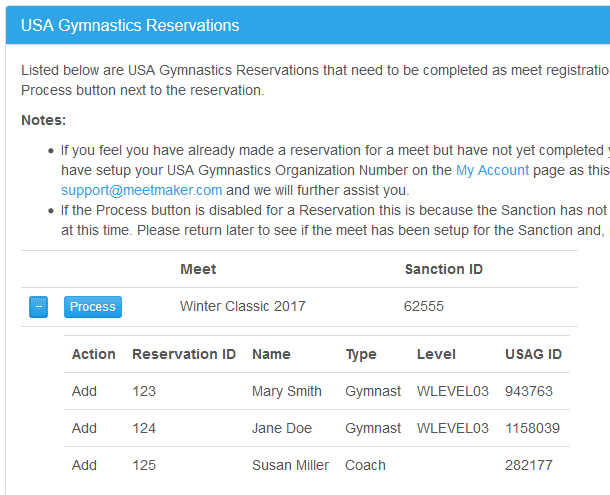 USA Gymnastics Reservations will only be sent to MeetMaker if the Meet Director has selected MeetMaker as the registration processing company on the USA Gymnastics Sanction for that meet. Please encourage your Meet Directors to eliminate the paper and use MeetMaker. If you have already registered for a meet on MeetMaker DO NOT also create a USA Gymnastics reservation. If you are unsure if you have already registered please go to My Gym > My Meets to confirm. The exception to this is if you are adding additional gymnasts and/or coaches that were not included in your original MeetMaker registration then you need to create a USA Gymnastics Reservation for the new participants only. This video will demonstrate the steps required to complete a MeetMaker meet registration via a USA Gymnastics Reservation. On MeetMaker, ensure you have entered your USA Gymnastics Club Number on the My Account page under Sanction Organizations. This is the key that links a Reservation to a MeetMaker account. Find the meet you would like to register for on MeetMaker and click the Register button or link. Once you enter your USA Gymnastics Reservation, return to MeetMaker, login or click refresh, and you will see a new alert. Click the Alerts window link to be taken to the Alerts page where you will see any pending Reservations that need to be processed into meet registrations. You can expand the Reservation to see the participants included. Click the Process button to process the Reservation. You will be taken to the MeetMaker Meet Registration page to complete your registration. Your gymnasts and coaches will already be pre-selected and you can edit any option fields available. You will then continue through the normal MeetMaker registration process adding teams if applicable and making your registration payment. This occurs when you have at least one "Add" in your Reservation. You will be taken directly to the MeetMaker payment page to pay for any level change fees due. This occurs when you have no "Add" entries but do have an "Update" entry that represents a level change and additional fees are due for the new level. You will receive a message saying your Reservation has been successfully processed. This occurs when you have no "Add" entries but have "Update" entries that require no additional fees for a level change and/or "Scratch" entries that require no additional interactions and the updates are made automatically for you. Once your Reservation is processed it will be removed from the Alerts page automatically. Intructions on how to list a meet on MeetMaker and link it to a USA Gymnastics Sanction so that is will be integrated with the USA Gymnastics Reservation System. Note: If you already have MeetMaker registrations for your meet BEFORE you link the meet to a USA Gymnastics Sanction MeetMaker cannot provide 100% USA Gymnastics verified data since the initial registrations were done solely on MeetMaker. Ideally you want to link your USA Gymnastics Sanction to your meet before you open your registration period to assure all registrations originated from USA Gymnastics Reservations. 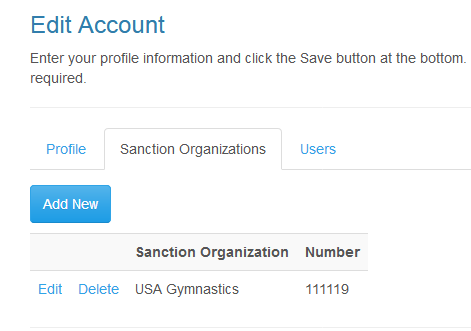 Ensure you have entered your USA Gymnastics Club Number on the My Account page under Sanction Organizations. This is the key that links a Sanction to a MeetMaker account. For regional and state meets that are under the regional or state account the linked Meet Director will need to have their club number in their profile if they are applying for the sanction. Please contact support@meetmaker.com for more information about this. Obtain your Sanction number from USA Gymnastics and select MeetMaker as the Meet Registration Company on the Sanction entry page on the USA Gymnastics website. If you already have a Sanction, edit it on the USA Gymnastics website and select MeetMaker as the Meet Registration Company. The Sanction data will then be sent to MeetMaker. You will see a new alert on the Alerts page on MeetMaker for this new Sanction but do not process this Sanction via the Alerts page since you are linking it to an already listed meet. On MeetMaker.com, edit your meet listing in MeetMaker using the Meet Wizard from the My Gym > My Meet Listings link. Scroll to the USA Gymnactics Sanction Number field in the Competition Details section. Ensure your MeetMaker levels match the levels you setup for the Sanction. If not, please update the levels to match and be sure to add a "Coach" level, if applicable, since you will not set that up for the Sanction. Enter you MeetMaker password and click the Save button. After linking, registering gyms will now be forced to first enter a USA Gymnastics Reservation and then return to MeetMaker to complete the registration. A link to the USA Gymnastics Reservation System website is provided when you click the Register button on the Meet Details page for your meet or when you click the Register link on the Home page for Meets page. Your alerts will now be cleared since the Sanction is now linked to a meet. Going forward, to add or remove levels for your meet, first make the changes on the USA Gymnastics website editing the Sanction. You will then recieve a new MeetMaker alert that you have updates to your Sanction. Please click the Process button on the Alerts page to process these updates, do not enter them manually. Obtain your Sanction number from USA Gymnastics and select MeetMaker as the Meet Registration Company on the Sanction entry page on the USA Gymnastics website. The Sanction data will then be sent to MeetMaker. Return to MeetMaker.com, login, and you will see a new alert you need to process. Click the Alerts link on the menu bar. On the Alerts page you will see your new Sanction listed. Click the Process button by the new Sanction entry. This will open the Meet Wizard and fill in the data and levels you entered for the Sanction. Fill in the remaining Meet Wizard fields manually or use the Copy Meet feature to fill in the remaining fields from a previous meet you have listed. Be sure to complete the Competition Levels details and add a Coach level, if applicable.